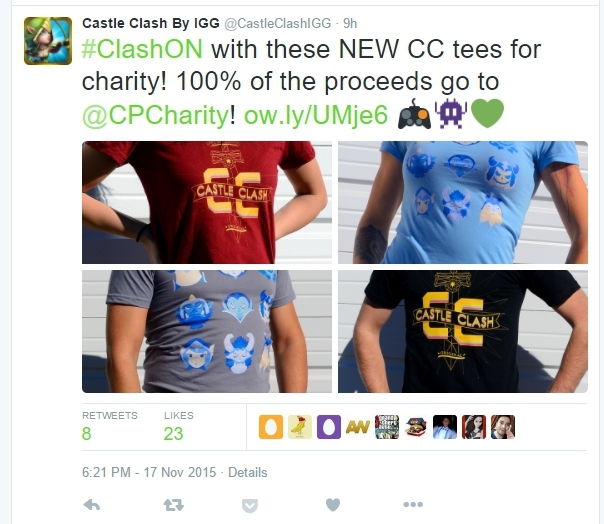 [Event] Show us your giving spirit with CC PowerUp! Tees! We are upon the holiday season which is the season for giving. In the spirit of giving IGG has given us a fun way to help out those less fortunate than us. Castle Clash is currently selling PowerUp! T-shirts and 100% of the proceeds go to Child's Play. For those of you not familiar with Child's Play, they are charity who seeks to help out children in hospitals and domestic abuse shelters. Below are a picture of some of the items available from amazon.com. Click here! Show us your giving spirit as we help others.